If you want an uplifting, somewhat philosophical children’s book, for a child who is wondering about the meaning of life, by all means, this book is the one to get. I picked it out because I loved Ms. Mass’s earlier book, Every Soul a Star, which is also quite philosophical in its own way. There is a similarity between both children’s books – they are set right in the heart of today’s culture, and, they offer timeless wisdom. Once or twice, I wondered if the wisdom was too heavy-handed. But then, I’m not a teen who is grappling with life. I would add that this children’s book is not for everyone. 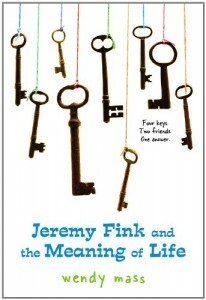 It really is philosophical, and for a young person not asking deep questions, the whole book could be boring. But I do feel there is an audience for it, probably between 11 and 13. Since it deals with death as well (his dad died before the book begins), it could also be helpful for young people grappling with what that’s all about. There was also a movie based on this book, but I don’t know that it was very good. Since so much of this story is about what Jeremy is thinking and pondering, it’s not clear how that could easily translate into a very good movie.